I purchased the fabrics for this quilt when I went to Juneau 5 years ago to attend the wedding of my niece, Sadie and Charles, who is full Tlingit. The main pattern is called Labyrinth, a pattern I found in Keepsake Quilting. The top and bottom blocks are Delectable Mountain. The side blocks are a French Braid. For the quilting I used Lisa Moore's applique patterns designed by Tlingit Woodcarver Tommy Joseph. I also used images from the Dover Clip Art Book on Northwest Coastal Indian images. Since my nephew is Tlingit, I asked him about authentic Tlingit weaving patterns. He told me about the Ravenstail, which I used in the labyrinth sashing. So the quilting has plenty of totem poles, salmon, orcas, wolves, elk, moose, puffins, ocean waves and ferns. I presented the quilt to Sadie and Charles this last weekend as a college graduation present. They are the first in both sides of the family to graduate college. Sadie graduated with a Bachelor of Science in Biology, minoring in Anthropology. Charles graduated with a Bachelor of Arts degree in Mathematics with a minor in the Tlingit Language. They will both become teachers in Alaska. University of Alaska Southeast has a wonderful Native Cultural Studies program with the most ever native graduates this year. I am so proud of them and they both love the quilt. Last edited by barbgooch; 05-06-2014 at 05:44 PM. This quilt is so beautiful and I'm sure it is very meaningful to them! They should be very proud of their accomplishments as you are and with good reason. They will treasure this quilt forever! You put a lot of thought, care and love into that project, and I'm sure they will cherish it. It's lovely. Beautiful quilt ....I love the research and care you took in design. It is amazing and I love it. It's beautiful and congratulations to all. beautiful and congrats tot he receivers. That is a beautiful and meaningful heirloom treasure. What a fantastic quilt, celebrating the melding of two cultures. I can well imagine how thrilled they are to have it. Love the sides as they look like the northern lights. A very special quilt for them! You added lots of neat details. That is a truly amazing work of art. Surely it is destined to become a family heirloom! Best wishes to the lucky couple. Great job and you created a really meaningful gift that they are sure to cherish. This is truly a fantastic work of art. I love everything about it. The quilting designs are the perfect touch - it helps capture the spirit of Alaska. Oh, absolutely gorgeous.. I want it!! Great work. 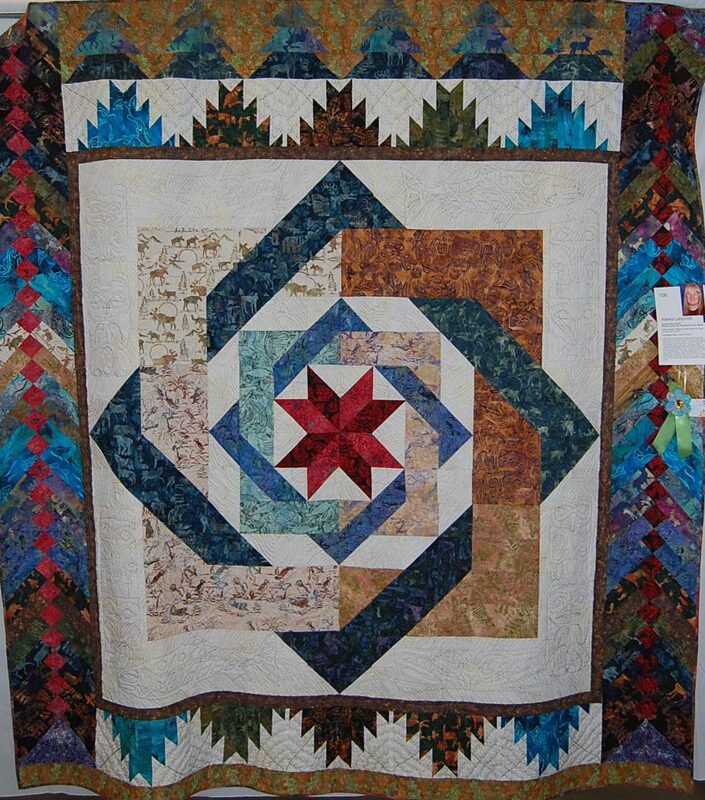 Beautiful quilt, wonderful colors, and the story behind it makes it even more special. What a beautiful quilt! I Love the quilting in the white border. It's a nice super special surprise! Love it!!! If you ever decide to share the pattern I would love to try it. Truly a work of art and soooo special. What a beautiful quilt. I'm sure they will pass it down from generation to generation. Beautiful quilt. I like the center. Congratulations to the graduates.